Sen. Ted Cruz (R., Texas) is calling on Secretary of State John Kerry to resign over recent comments by senior Obama administration officials accusing Israel of committing "terrorism" amid a spate of violent attacks by Palestinians against Jews. Palestinian terrorists have murdered at least eight Israelis and wounded dozens more over the last few weeks, with Palestinian leaders calling on citizens to commit more violence. However, the State Department has attempted to blame Israel for fostering these attacks. Kerry blamed so-called Israeli "settlement" growth for the violence, while State Department spokesman John Kirby accused Israel of committing "terrorism." The comments sparked outrage among pro-Israel observers and prompted Cruz to demand that Kerry accept responsibility for the remarks and resign. "Once again Sec. Kerry and his staff have proven themselves utterly unfit for the positions they hold," Cruz told the Washington Free Beacon. "Mr. Kirby should immediately retract his offensive assertion that Israel is ‘guilty of acts of terror’ or resign, and Secretary Kerry should immediately disavow these remarks or resign." The "offensive" comments are a pattern for the State Department. Cruz first called for Kerry’s resignation in April 2014 when the secretary threatened Israel could become an "apartheid state" it did not give in to his demands for concessions to the Palestinians. This time around, Kerry prompted outrage when he blamed a new bout of violence from Palestinian terrorists on "settlement" growth. 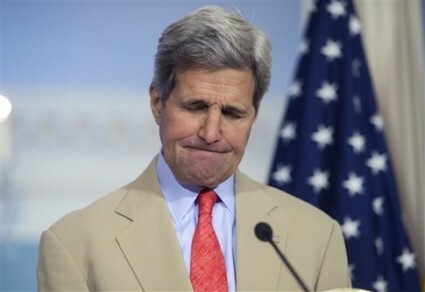 "There’s been a massive increase in settlements over the course of the last years," Kerry said. "Now you have this violence because there’s a frustration that is growing, and a frustration among Israelis who don’t see any movement." Spokesman Kirby also garnered criticism when he accused the Israelis of "terrorism" against Palestinians and said there were "credible reports" of Israeli police using excessive force against civilians. "Individuals on both sides of this divide are—have proven capable of, and in our view, are guilty of acts of terrorism," State Department Spokesman John Kirby told reporters on Wednesday following questions about the spike in violence. "We’re always concerned about credible reports of excessive use of force against civilians, and we routinely raise our concerns about that." "The Obama Administration is the most hostile we have seen towards the nation of Israel in our nation’s history," Cruz said. "In the last few days, this obsessive antagonism has been on full display." Rep. Lee Zeldin (R., N.Y.) called on President Barack Obama to fire spokesman Kirby. "It is absolutely disgusting and shameful that the Obama administration not only refuses to stand strong with our ally in Israel, but actually has the audacity to claim that the Israelis are guilty of terrorism," Zeldin said in a statement Thursday. Zeldin went on to say that Kirby’s comments warrant an "immediate removal." "Admiral Kirby’s accusation warrants his immediate removal. He should absolutely not utter one more word on behalf of America’s foreign policy. If Secretary John Kerry refuses to speak out and discipline Mr. Kirby than Secretary Kerry needs to step aside as well," Zeldin said.